So, what do you do with content that has intrinsic value, but is hard to include in your existing product line? Create a new product line! This new 16-page eBook sees the advent of a new Build Article Series, which will feature the occasional brief, article-length guide that doesn’t fit any of our usual formats. And Building the Revell X-Wing in 1/48 Scale, by Steve A. Evans, certainly fits the bill. It’s a targetted, 16-page build of the Revell (ex-Fine Molds) 1/48 scale X-Wing kit, and we’re offering it as a free download. Click on the “Read More” button below to visit the product page and download your copy. New Sabre / Birddog Bundle! 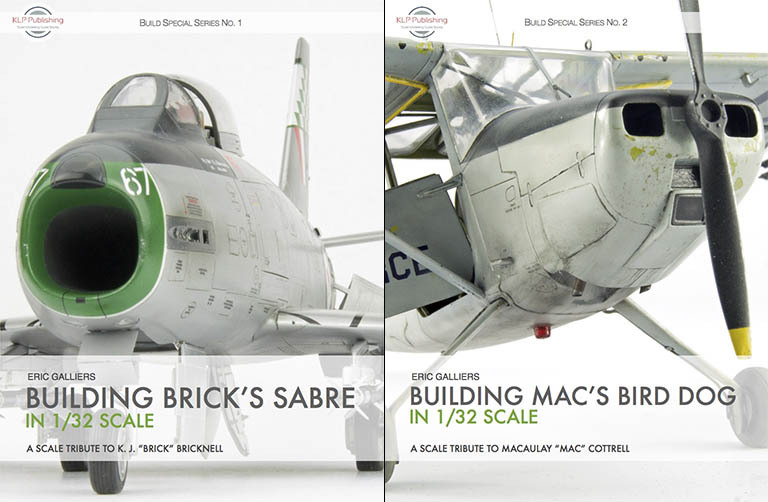 Our second book, Building Mac’s Birddog in 1/32 Scale, has just celebrated its first anniversary, so we thought we might bundle it together with its predecessor, Building Brick’s Sabre in 1/32 Scale, and offer them together at a discounted price. Both books are by Eric Galliers, and feature tributes to two fine RAAF airmen, and the aircraft they flew. Normally $15 each, this bundle can be had for a mere $25! All quoted prices are in Australian dollars. v1.1 of “Building the HpH Fw 189” Now Available! An eagle-eyed customer has pointed out a minor error in the text of the new Uhu book, so I’ve just finished uploading v1.1, which corrects this error. If you’ve already bought the book, you can re-download the new version free-of-charge via your original download link. New purchasers will of course get the latest version by default. Thanks to everyone who has purchased the book so far! “Building the HpH Fw 189” is Now Available! I’m pleased to announced that Jan Gabauer’s Building the HpH Fw 189 ‘Uhu’ in 1/32 Scale is now available! This 66-page eBook sees Jan tackle the impressive mixed-media 1/32 scale Fw 189 kit from HpH Models. The majority of the kit parts are cast in polyurethane resin, augmented with turned metal and photo-etched parts, paint masks, and HGW ‘wet transfers’. A set of HGW ‘fabric’ seat belts is also included, making for a complex kit and a potentially challenging build. Jan navigates the complexities of the build with aplomb, offering tips for working with resin assemblies, and overcoming the particular challenges of this kit. The process is very instructive, and results are quite spectacular! The book is available as a downloadable PDF for just 8 Australian dollars (AUD$8). Click on the link or image above to visit the product page and purchase the book. Announcing our next Build Guide featuring the HpH 1/32 Fw 189! I’m pleased to announce that the next title in our Build Guide Series will feature the 1/32 scale Fw 189 kit from HpH Models. Entitled Building the HpH Fw 189 ‘Uhu’ in 1/32 Scale, and written by Jan Gabauer, this eBook will take you through the build process for this complex multi-media kit. Jan’s build is exceptional, and shows just what can be achieved with the right approach. Please stay tuned for more news on this release in the coming weeks! v1.4 of Building Race #80 is Now Available! As we know, nothing in this world is perfect—least of all the process of publishing a book! Feedback from readers and contributors has led to some further refinements of the new Spitfire book, and this has resulted in v1.4 now being available. New purchasers will receive this latest version by default, but existing owners can also update their copy by re-downloading the book (please see the article Purchasing and Downloading Our Books for more information). Hopefully there won’t be a v1.5! Version 1.1 of Peter Castle’s Spitfire Book is Now Available! As Murphy’s Law would have it, now that Peter Castle’s new Spitfire book is out, one particularly diligent reader has identified a number of typos in the original release (well, three to be exact). These were very minor, but I felt it was important to correct them—this being one of the benefits of digital publishing! I’ve now uploaded a new version of the file, which is what new purchasers will receive from now on. If you’ve already purchased the book, you can simply re-download the newer version using the link in your original download email. If you no longer have that email, please see our article Purchasing & Downloading Our Books for more information on how to obtain the file. I’d like to thank Paul Monforton for bringing these errors to my attention. Building Race #80 in 1/18 Scale is Now Available! I’m pleased to announce that Peter Castle’s Building Race #80 Spitfire Mk XIVe in 1/18 Scale is now available! This 565-page eBook features Peter‘s award-winning conversion of the HpH Models 1/18 Seafire 47 to represent a Spitfire XIVe—specifically, Race #80, as flown by James McArthur in the Tinnerman Air Races at Cleveland, Ohio, on September 4th 1949. Peter rebuilt much of the airframe, scratch-built most of the detail parts in aluminium and brass, and covered the model in aluminium litho-plate for an authentic natural metal finish. Peter’s model won the National Senior Champion award (among many others) at Scale Model World in Telford in November 2017, and its construction is presented here in forensic detail. bonus: seven full-page walkaround photos of a Spitfire Mk 19 seat. This book is a must-have for aspiring scratch-builders, Spitfire fans, and any modeller interested in learning from the best. Peter Castle’s Spitfire Book Reaches 400 Pages! Barely a week after posting that our next book, Peter Castle’s Building Race #80 Spitfire Mk XIVe in 1/18 Scale, had clocked up a massive 300 pages, I now have to report that it has just blasted through 400 pages! The sheer scale and scope of Peter’s magnificent build has necessitated the book growing to an unanticipated size, but this just makes it all the more compelling! This will mean that this title will be slightly more expensive than our previous three releases, but much better value on a page-per-dollar basis. I’d like to say that we’ll be ready to publish in a couple of weeks, but with so much amazing content to sort through and fashion into pages, I’m not prepared to guarantee it! More news when I can bring it. Peter Castle’s Spitfire Book Reaches 300 Pages! After a longer-than-expected forced hiatus, work resumed recently on preparing our newest title, Peter Castle’s Building Race #80 Spitfire Mk XIVe in 1/18 Scale. The book, much like the model itself, is fast becoming an absolute monster, and has now breached the 300-page mark! It will not only cover the building of Peter’s model in exquisite detail, but will also feature several technique tutorials from Peter himself, a handy set of walkaround photos of a Spitfire seat by Tony Taylor, and an article and artwork on #80 from Juanita Franzi. Work continues at a feverish pace, and it’s about 70% done. I’m hoping we’re now only a matter of weeks away from publication.